This piece is the 100th Maldives Complete post. When the site was inaugurated, I added a blog to the web site to provide a way to dynamically update and cover the more qualitative aspects of the resorts that could not be accommodated in the core database profiles. I included some special pieces that covered a few interesting stories, factoids and useful info, but quickly the blog gravitated to the vehicle to regularly recognize the resorts’ uniques and superlatives in a very broad and even quirky range of categories featured in the ‘Best of the Maldives’. I’ve decided to celebrate the 100th post milestone with a bit of a retrospective review of the Best of the Best. The recognitions themselves are highly unscientific in the first place (though most of the feedback is that they are pretty spot on) so the aggregate tally will be even more so. Another caveat is that while a number of ‘Best Ofs’ have been published, nearly as many remain unpublished. I continue researching them and posting them on a regular schedule, but have decided not to rush things or overwhelm the growing readership with too many too often. This wealth of material has led to my next project which is to adapt all of it into a ‘Best of the Maldives’ guide book which has been spurred by interest and support from a number of corners. Soneva Fushi tops the list with 5 published superlatives in total (including 1 I haven’t published yet), but Kurumba tops the overall list with 7 overall (including 5 not yet published). There is huge bias in this stat not because I have any particular affinity for Kurumba, but because I recently stayed there and was able to uncover all sorts of gems and special aspects that even Kurumba hadn’t appreciated that it had (eg. exceptional handicap access). As a result, to help balance the score and to similarly ferret out all sorts of other unsung gems, I am currently planning my next trip to the Maldives in July to cover as many resorts as I can to get more research for both the site and the book. All those with 3 or more awards so far are listed above. One of the defining characteristic of the Maldives are their miniscule islands, but if such diminutive scale is too claustrophobic for you, then maybe you want to consider the other end of the spectrum. 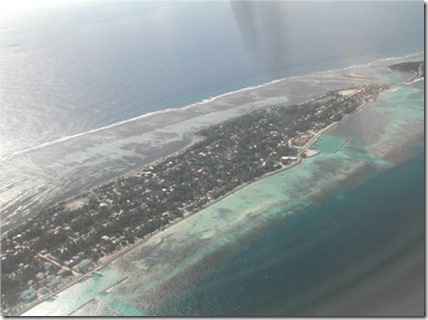 The largest resort island (the second largest island in the whole country after Hithado in the same atoll) in the Maldive archipelago is Gan at 2,256 square km. That compares to an average across all the resort islands of about 200k square metres. Gan’ s resort is Equator Village. Gan also has an extensive history which includes a British naval base established there in World War II and an ancient Buddhist temple. If Zen is your thing, then Vadoo might just be another resort to consider. Vadoo has developed an entire Japanese experience including Ryokan style water villas designed and services by Japanese, Japanese Tea ceremony, and a traditional Japanese ‘Kaiseki’ dinner served at the restaurant or in room. One popular feature that I do adore is the al fresco bathing. 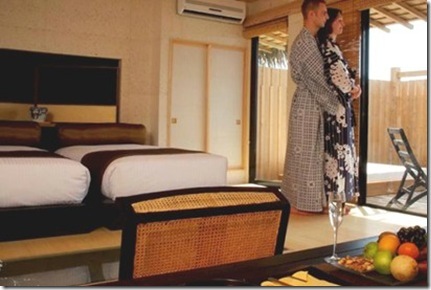 It is not an uncommon luxury feature of tropical resort, but they are typically secluded to a sheltered back garden. But if you want the experience with elegance, style, comfort and a view, the Island Hideaway at Dhonakulhi has really nailed it with their Hideaway Water Suite. 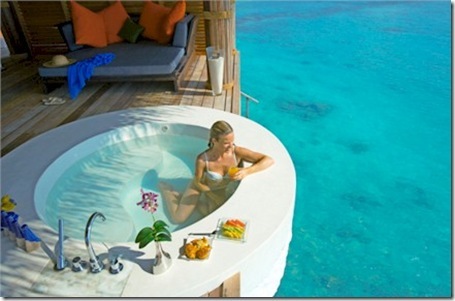 The tub is perched right on the best view of the ocean. It reminded me of our stay at Londolozi Game Lodge in South Africa where the designers had smartly put the elegant tub by a big window overlooking the river down below. You could watch the elephants bathing while you had your own scrub. 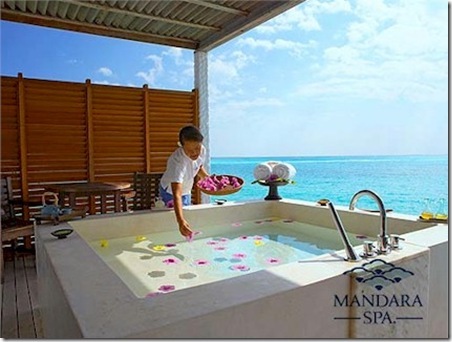 And if you can’t or don’t want to spring for the posh Water Suite, you still can partake of a lagoon-vista’ed soak at their Mandara Spa (see below). While TripAdvisor is the granddaddy of the general travel community/forums, many resorts are setting up their own online communities on their websites just focused on their resorts. 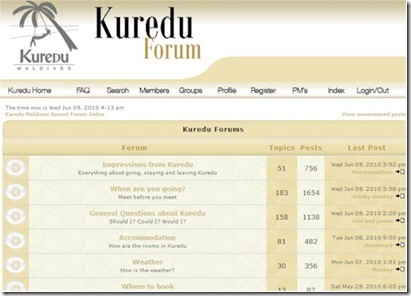 Some of these have scant posts and interactions (and one in particular falls afoul of poor attitude by the administrator), but one resort online community stands out as vibrant, easy to use and friendly – Kuredu. This week happens to be my birthday (yay!…thanks), and actually, this it also marks the year-and-a-half milestone for Maldives Complete itself. In fact, the 100th post is just a few weeks away (this one is #95). Many people think that folks of my vintage start to dread their birthdays, but actually I am finding that I enjoy them more and more. 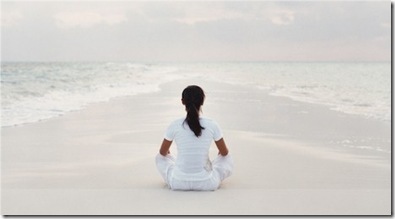 There is a certain charm and dignity to the wisdom of the ages and the experience of a lifetime. 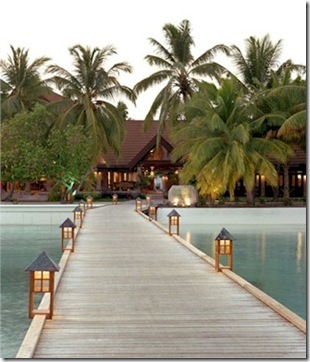 And speaking of ‘experiences of a lifetime’ brings me right back to the subject at hand…Maldives resorts. As it happens the resort with the biggest bragging rights on time tempered experience and the most birthdays to its name is where our family celebrated our own holidays this year – Kurumba. Kurumba is the very first resort to ever open in the Maldives. Active since 1972 when Maldives was sort of a hidden gem for a select in-the-know divers and sailors, the resort has built a longstanding reputation and infrastructure which has served some of the most illustrious names including US Presidents George Bush Snr. and Bill Clinton. It has had its share of facelifts and tummy-tucks (complete renovation in 2003) so it still maintains a freshness amidst its grandeur of seniority. 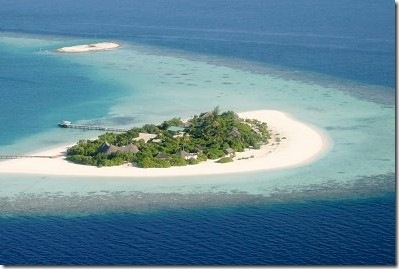 Two qualities describing the Maldives go hand in hand – tiny and exclusive. So what is the smallest and most exclusive of them all?